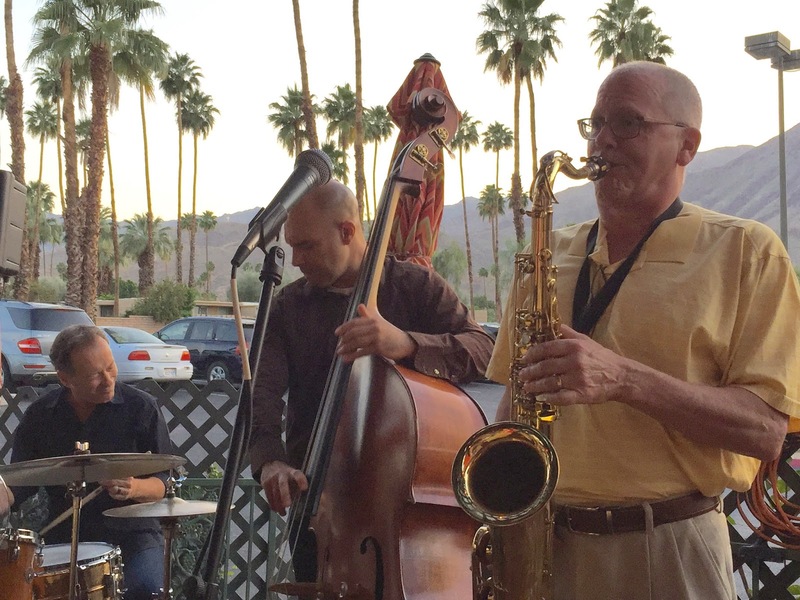 Last Tuesday night April 14 was another wonderful night of Jazz at Backstreet Bistro. 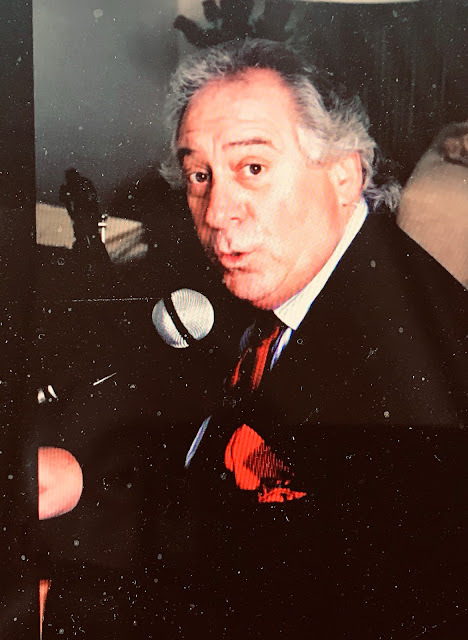 Jay Lewis assumed leadership of the band for Bill Saitta who is off working and partying in the "Big Easy". Jay invited Tom Keenlyside, Blake White and Pat Tuzzolino to join the fun. 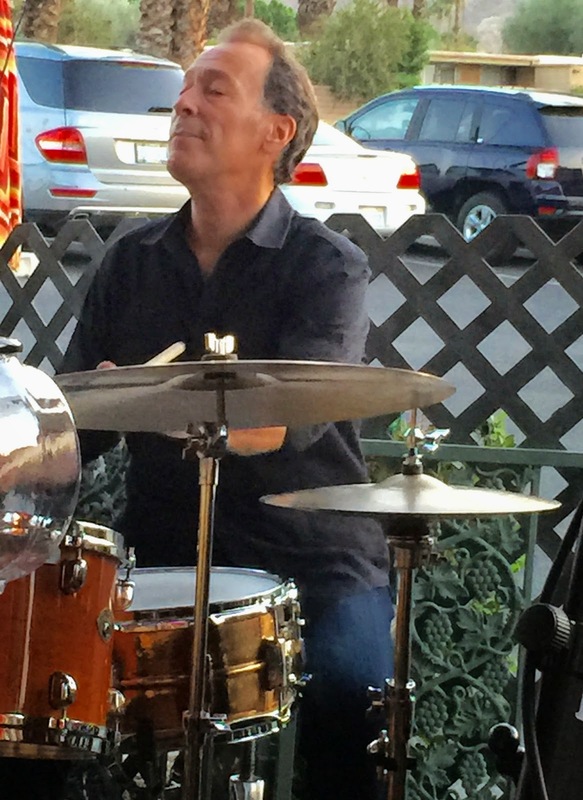 Jay Lewis is one of the most respected musicians playing in the Desert, and I know this is true because every musician I talk to tells me he is on their list of top Drummers. In addition to his wonderful Drumming talents, Jay is a truly wonderful person. No flash or ego, he just gets in front of his Drums and makes wonderful things happen. If you love intelligent, swinging Jazz Drumming, don't ever miss a chance to hear him. 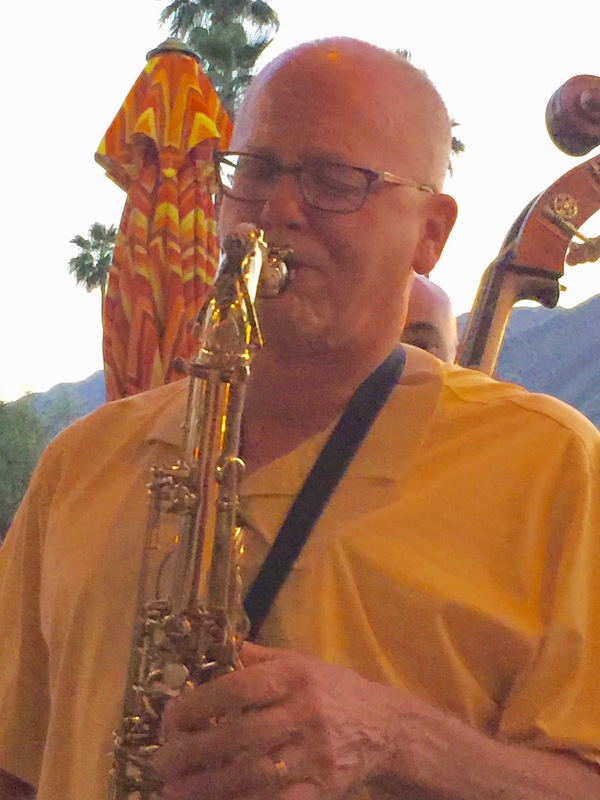 Tom Keenlyside, the talented Canadian Sax and Flute player has only been in the Desert for a few years but, he has already become a Jazz household name here. Tom plays the greatest Flute I have been privileged to hear and his Sax playing is top rate. Tonight, Tom also proved he is also quite the singer, performing several tunes with the band. What's also great about Tom is that his whole life is focused on music and not just playing it. Tom composes, records in his own music studio, arranges and tours with the best groups in the business when he has any free time. He is a true professional and brings no agenda with him. He always has time to help other musicians with suggestions and direction expecting nothing more than a thank you! I understand that Tom will be back at Backstreet next Tuesday, so make your plans to be there. The opportunity for Jazz lovers to get up-close to a talented performer like Tom are rare, so don't miss any chance you get to hear him. On Bass tonight was the young and talented Blake White. I have heard Blake a few times over the past few years and in my opinion he is now playing as good as I have ever heard him. His solos are new and crisp and original. Blake has obviously has been working hard to lift the level of his Bass playing and the results are terrific. The last member of the group tonight was Pat Tuzzolino. I found Pat a few years ago and became an instant fan. Pat played wonderful guitar tonight, and also sang several songs. Multi-talented Pat also plays keyboard and Bass. But in my opinion, Pat's real brilliance is in his singing. Pat sings Jazz standards in his own unique way, and he provides his own arrangements that are outstanding and can turn an old classic "Chestnut" into something new and beautiful. It always surprises me that so many Jazz fans in the Valley are not familiar with Pat because he is without a doubt one of the most talented musicians you will ever hear. I know this is a bold statement but I believe it is true. 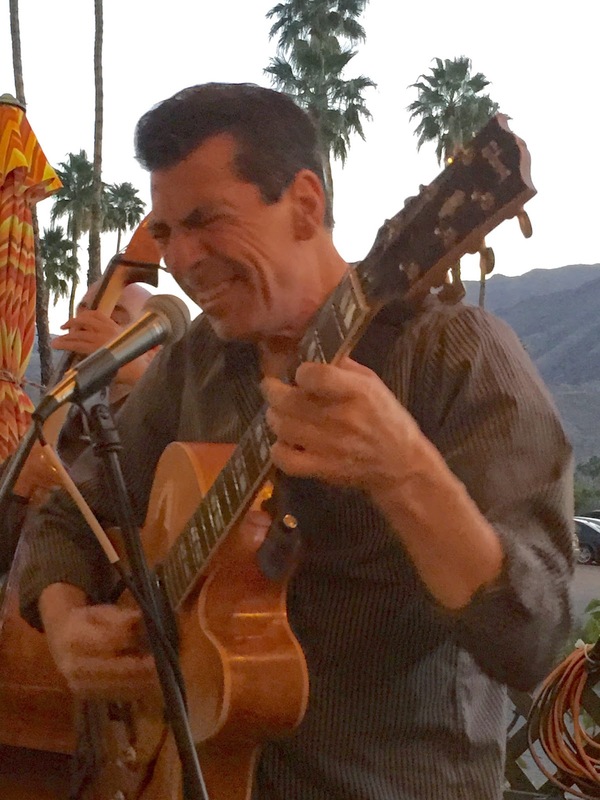 Pat plays in the bar area at Castelli's Restaurant in Palm Desert on Wednesday through Saturday. Never miss a chance to hear him. I found a "YouTube" of Pat singing "Yellow Days" at Vitello's on 7/29/13. He is joined by Larry Koonse on Guitar and Dan Williams on Drums. 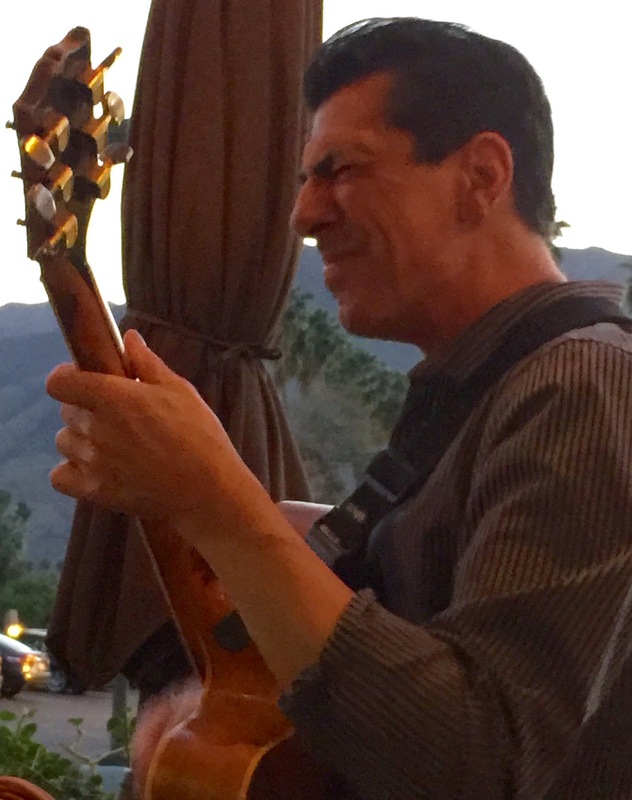 This video will give you a good idea of the remarkable musical talents of Pat Tuzzolino. CD Review: Michael Dees, "The Dream I Dreamed"
CD Review: Joanne Tatham: "Out Of My Dreams"
CD Review: Robert Kennedy Trio, "Big Shoes"